New excavations at an ancient woodland site between Monday 9 April and Saturday 21 April could unearth secrets of its 3,000-year-old Iron Age history. The Fingle Woods project – led by owners the National Trust and Woodland Trust charities and made possible made possible thanks to £730,000 of National Lottery funding from the Heritage Lottery Fund (HLF) – will carry out an archaeological excavation at Wooston, home to an internationally recognised Iron Age Hillfort, Wooston Castle. The charities are looking for volunteers to assist with the excavation, particularly people with previous experience of digging. There will also be a public open day on Saturday 21 April 11am-3pm with tours of the site, hands on activities and information about the excavation findings. More details of the open day can be found on the Fingle Woods blog (finglewoods.org.uk). For many years the hill fort remained hidden by advancing nature but recent clearances of conifer and bracken have opened it up, bringing archaeologists unprecedented access to delve further into the history at this precious Devon site. Experts will use small hand shovels and mattocks to delicately chip away at the site. The hillfort has a dramatic position high above the river in the Teign Valley, with commanding views to the west along Teign Gorge and beyond, towards Dartmoor and also to the rolling landscape to the east. 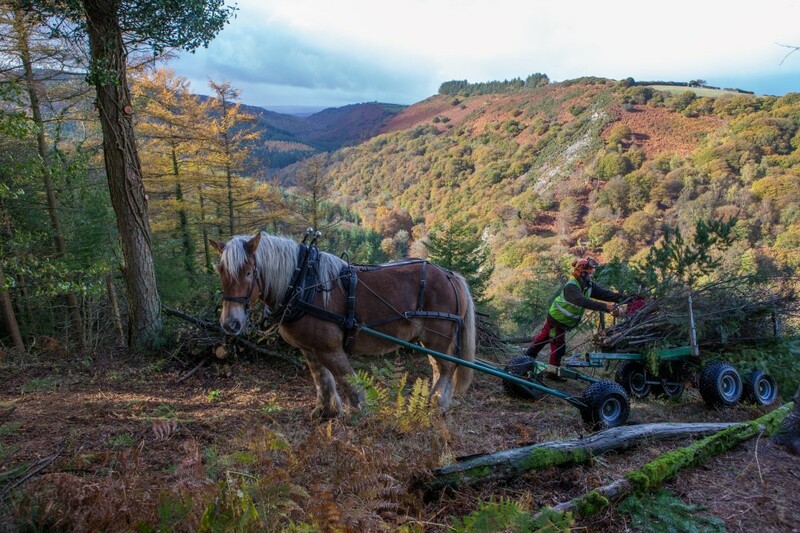 Utilising teams of horse loggers, the charities carefully extracted vast quantities of timber in order to protect the fragile archaeology that had been hidden by nearly a century of coniferous forestry planting. Wooston is a relatively unusual hillfort as it does not sit right on the top of the hill. The tree clearance has demonstrated the strategic nature of the site where a huge expanse of landscape would have visible to the people who used it. However, the remains of the hillfort’s banks and ditches are confusing and unconventional, leading to much speculation on the true nature of this fascinating site. In 2017, the Wooston hillfort was surveyed using geophysical techniques to assess the likelihood that archaeological deposits had survived the forestry activity of the 20th century. The site was assessed using two techniques, magnetometry and resistivity. Magnetometry is a technique which measures and maps patterns of magnetism in the soil. Ancient activity, particularly burning, leaves magnetic traces that show up even today when detected with specialist equipment. Resistivity is a form of geophysical survey where electrical current is passed through the ground at regular points on a survey grid. Electrical resistance in the soil varies, and is affected by the presence of archaeological features. The patterns of resistance in the soil are then recorded, plotted and interpreted.